Sea level may rise a meter or two (more likely about half a meter) over the next century. Better get out of the way. For those of you who have actually lived in areas that were at risk of significant storm surge you'll understand the ludicrous nature of the 'catastrophic sea level rise' claims bandied about by enviro-alarmists. A couple centimeters a year? Really? That's a catastrophe? Try eight meters in a matter of hours, wimps. [Update: (I feel a bit sheepish for the lack of any intellectual content in this post, I'll blame it on the nice glass of Malbec I had the evening I posted it.) Here's an interesting paper that talks about hysteresis effects in ice-sheet dynamics. They present a graph showing change in ice volume in starting from no ice in a cooling climate, to change in ice volume starting with lots of ice in a warming climate. In our model with orbital forcing, CO2 levels need to rise slightly above 3xPAL [pre-industrial levels] to induce drastic retreat of pre-existing EAIS... however our current coupling method does not fully capture terrestrial ice-albedo feedback, which can affect Antarctic temperatures and precipitation just as much as orbital and CO2 changes... we have found that including [those effects] increases hysteresis... so that transitions occur at 3x and 4x PAL CO2, and are more sudden than those in Fig. 2a. Due to the mass inertia of the ice sheet, climate fluctuations out of equilibrium with current ice must be maintained for several thousand years to have an appreciable effect on East Antarctic ice volume, and to induce transitions such as those described above. 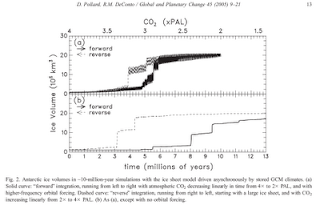 [...] However, our paleo-climatic simulations are not directly applilcable to the next ~5000 years, since the time scales of CO2 change are very different, and since we include full orbital variations. [...] In preliminary experiments [...] we find that CO2 levels must exceed 8xPAL to induce significant retreat from full ice-sheet conditions. Invitation to click over to TheOilDrum.com to read a posting of mine. Entropy in the context of rare and fat-tail events. What we actually observe amounts to nothing more than our own filtered view on a disordered state. That reminds me of a paper recently mentioned on Nuit Blanche about image reconstruction through turbulence. Of course, they are hoping the thing they are viewing, filtered through turbulence, is actually 'ordered'. As the key point to retain, the observed disorder runs high enough so as to simplify the entire argument, both mathematically and conceptually. That's a great bit of insight. It's like kinetic theory of gases, the motion of an individual particle is so disordered, yet figuring out the right velocity distribution (max ent) gets us to the continuum equations, and we don't have to worry about tracking every particle. The name I immediately thought of for your organisms per acre term would be density or number density (since my background is fluid dynamics), but I guess that might get confusing because you are talking about probability densities too, and you're already pushing the sophistication level for a broad readership. I make the claim that diversification and growth of speciation possesses maximum entropy. So, taking the analogy back to kinetic theory, you are claiming that diversification and growth is at equilibrium (or gets there 'real quick' after disturbances). I don't know much about ecology, but that seems intuitively reasonable (and your single parameter model does ok compared to the three parameter one). I think it makes even more sense for your oil reservoir application, because the long time-scales of reservoir formation and growth are basically at infinity compared to the short time-scales we care about. Speaking of scorn for the abstract, Boltzmann's ideas were initially scorned as well. There are few things in life which depress me as much as modern man's superimposition of his mentally-fabricated order upon a Natural world which we know so little about. who gets a nice echo from joule (who, it turns out, is an engineer and should know better), and then the piling on by Michael Dawson and hightrekker. Jaynes talked about the mind projection fallacy too, but we're not pretending the model is reality, just a possibly useful description of what we see. I think it's funny, and a little sad, that a simple expression and a couple of integrals is described as 'arcane'. I thought you did a good job of applying accessible ideas and math towards explaining some interesting real-world stuff. At first I was going to ask you why you post there, but you do actually get some good feedback (mikeB, Gail the Actuary, BC_EE, etc.). Keep up the good work, the world needs more 'outliers'. Thanks for the comments. The pickings are slim for finding a worthwhile forum to post in and get valid feedback as well. I have occasionally thought about using slashdot.org but that can get crazy fast. Your blog has some very good analysis so I will definitely refer to it when I need the extra insight. BTW, everyone in the media seemed to think the tsunami should have been huge as opposed to radially dissipating after crossing a large open ocean. I would think a soliton-like wave would take just the right conditions to propagate, and so would be the exception rather than the rule. Which gets me thinking that what I refer to as an entroplet is conceptually a soliton travelling along a logarithmic time and space scale. This preserves the scale-free nature of the waveform. We have met the enemy and he is us: What Causes Disasters? WHT, on entroplets, that's an interesting connection, I never really thought of them 'traveling', but it makes sense. Solitons are the extraordinary exceptions, that's why they get so much press. ... although this would take place over millennia. For the future, the effects of thermal expansion and mountain glaciers can be reasonably estimated—the real question is what will happen with respect to Greenland and West Antarctica, the melting of each of which over perhaps a 1000 years would raise global sea level by of order 6 m—most of Houston will either be under water or behind huge levees. For the 21st century, the IPCC projects that the contribution of the two ice sheets to sea level rise will be quite small (also seeming confident that snow will build up on East Antarctica). While what the public discussion is mainly about has been whether the upper bound of IPCC- projected warming of over 5oC during the 21st century is plausible, yet what a number of US glaciologists wrote in objecting to the IPCC conclusions about the sea level estimates was that Greenland and West Antarctica may be much more vulnerable to warming than was estimated and so IPCC may be underestimating the amount of sea level rise. Given how much low-lying land there is in the US, this is a critical uncertainty, yet one that will be very hard to resolve because the freezing point is basically a threshold—below it and the snow builds up, above it and a process of inevitable collapse is initiated. To ensure ice sheet collapse does not begin, conditions favoring accumulation must be ensured, but with such conditions, there will be no observational evidence about where the threshold will be. Will society accept a purely theoretical calculation of the threshold, or will the world wait for evidence until melting has begun, at which time it will be too late to go back? It may well be too late to 'go back' once things start melting, but even if all emissions were shut off tomorrow there's no way to 'ensure' that collapse wouldn't happen anyway, and given 1000 years to adapt to the rising levels, I think we'll be able to handle it without drastic policy proscriptions. So is there really a difference between the application of doubt by the warmers, and by the tobacco strategists? The warmers use doubt about future security, while the tobacconists – as they are depicted by Oreskes – doubt that the science is sufficiently complete to make statements about the security of the future. The two “sides” Oreskes invents only differ in how best to respond to the same doubt. The dichotomy that Oreskes asks us to consider is not which argument is more sound, but which is safer, given the honesty of the parties in question. Oreskes invents an opposition and an argument for them, in order for the precautionary principle to look sensible by contrast, because scientific “fact” is not something Oreskes even has time for. This analysis suggests that a significant acceleration of sea-level rise due to a WAIS [West Antarctic Ice Sheet] collapse (or any other cause) could have a profound effect on the impacts of sea-level rise. In terms of a cost-benefit analysis, it suggests that it would be appropriate to abandon protecting large lengths of the world’s coasts, although about 50% of the world’s coasts could still be protected at considerable cost. This latter result is surprising, as the widespread view is that any large rise in sea level is beyond our capacity to adapt and a global retreat will result. Support for the results presented here can be found from subsiding coastal cities during the 20th Century such as Tokyo which subsided up to 5-m due to groundwater withdrawal (Nicholls, 1995). Nonetheless, the response was always to protect, and cities such as Tianjin, Shanghai, Tokyo, Osaka and Bangkok have large areas below mean sea level which are dependent on coastal protection and pumped drainage. However, the results here appear to conflict with the three case studies of the Netherlands, Thames Estuary and the Rhone delta, which suggest a greater tendency towards abandonment than the global model. This difference may reflect non-economic factors that are not considered in the global model, such as an overall loss of confidence triggering a cycle of decline. It was also observed in the Thames Estuary case study that paralysis which might well delay an adaptation response too long for it to be effective, leaving retreat as the only viable option. Again this process is not included in the global model which assumes perfect adaptation where it has an appropriate cost benefit. Therefore, these results show that a WAIS collapse would have profound effects on the world’s coasts, and it remains somewhat uncertain to what extent we would be able to respond. Risk assessments require regional- scale information. Thus, in addition to the current approach based on global climate models, local and regional resource-based foci are needed to assess the spectrum of future risks to the environment and to the resources required for society. For example, by regulating development in floodplains or in hurricane storm surge coastal locations, effective adaptation strategies can be achieved regardless of how climate changes. Follow Up On Weather Channel Interview Of Kevin Trenberth and Roger Pielke Sr.
After the 1913 flood, Dayton didn't commission studies about the nth-order marginal contributors to the anomalously large rainfall, they invested in flood control infrastructure!